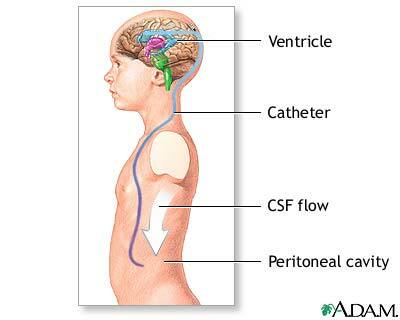 A small catheter is passed into a ventricle of the brain. A pump is attached to the catheter to keep the fluid away from the brain. Another catheter is attached to the pump and tunneled under the skin, behind the ear, down the neck and chest and into the peritoneal cavity (abdominal cavity). The CSF is absorbed in the peritoneal cavity.